A Republic of Korea Air Force Black Eagles aerobatic team T-50 crashes during Singapore Airshow 2018. 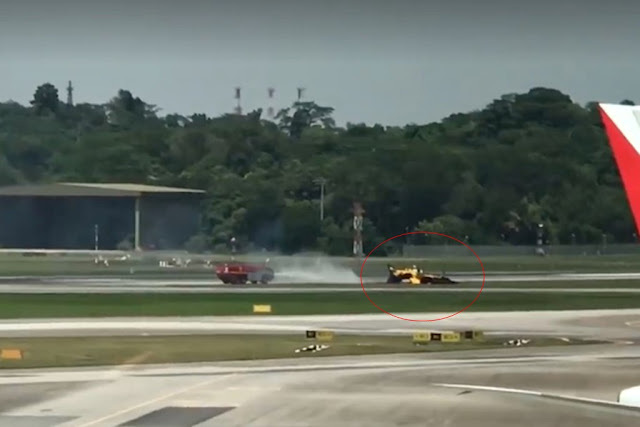 Febrary 6, 2018 - Today, in the afternoon, a Republic of Korea Air Force T-50 trainer jet assigned to the Black Eagles aerobatic team skidded off the runway during takeoff. The plane then overturned on the grass and caught fire. The T-50 was taking off following the other seven aircraft to take part in the daily flying display included in the Singapore Airshow 2018. According to Changi Airport FB page, the accident occurred at about 1.30 pm. The Airport Emergency Service put out the fire. The pilot managed to leave the plane and he was sent to the airport clinic for a check-up. The team operates 8 indigenous supersonic trainer jet developed by the Republic of Korea.